A SCENE IN HIGH LIFE. To my tol de rol de do, ri dle, &c.
Send up the Nurse to wash & dress this pretty little rage. Images and transcriptions on this page, including medium image downloads, may be used under the Creative Commons Attribution 4.0 International Licence unless otherwise stated.
" ... the new steam carriage, &c". The text mentions 'B-'s Poor-Law Bill' perhaps a reference to the 1834 Poor Law Bill. Imprint reads: Reprinted from Pitts, London: Being an answer to the poisoned family. First line reads: Attend unto my ditty, & a story you shal [sic]/ hear. Tune: - The present fashions. To find similar items, select the checkboxes next to the characteristics you are interested in, then select the 'Find similar' button. 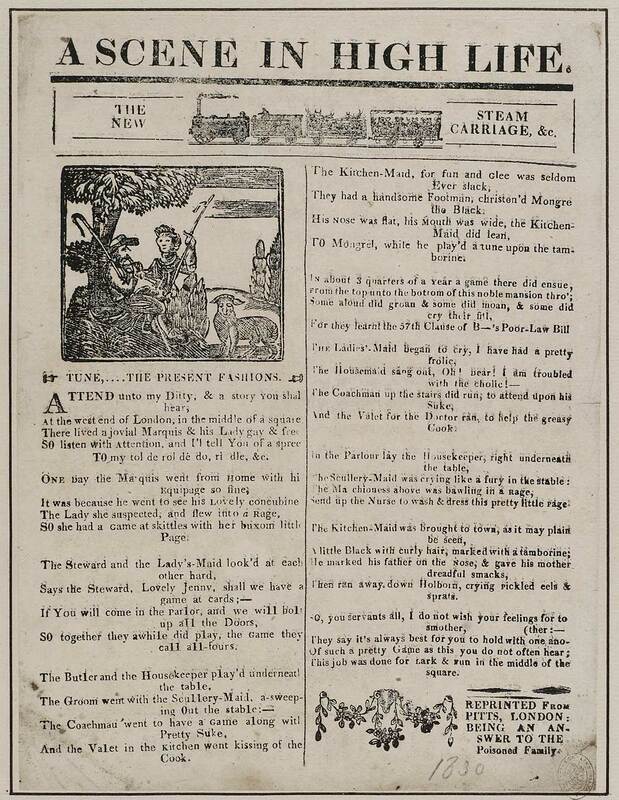 Collection of 2,300 broadside ballads, mostly printed in England in the 19th century. Topics range from courtship, crime, disasters and emigration to fashion, theatre, politics, laments sports and old age. Includes ballads on Scotland and Ireland. Part of the Crawford Collections on deposit from the Balcarres Heritage Trust. Reproduced with permission from materials on loan to the National Library of Scotland from the Balcarres Heritage Trust.